The use of this website by any user shall be governed by the following Terms and Conditions, implying its use as acceptance by the user. If the user rejects these Terms and Conditions, you must cease use of the website. Access to and use of the website are made available exclusively for personal use and for the promotion of goods and services considered to be of interest to the visitors / users of the website or to communicate with them for other purposes (the ‘Services’). PACSIS reserves the right to evaluate at its discretion the enforcement of these Terms and Conditions by any user. The violation of the Terms and Conditions can imply the withdrawal of the license of use granted by PACSIS, in accordance with the Clause 1, as well as to exercise their rights to the maximum extent permitted by law. Users agree to indemnify and hold PACSIS, as well as legal representatives, partners, and employees, from any damages, responsabilities, complaints or requests for compensation, including expenses and costs of representation, petitioned by third parties as a result of the use of the website in non-compliant terms with the present Terms and Conditions, and/or by virtue of violation of the conditions laid down in it, and/or arising from a breach of the representations and warranties presented in these Terms and Conditions. Without prejudice to what is presented in the other clauses of the present Terms and Conditions, PACSIS authorizes any user to use this website only for personal or informative purposes, as provided in these Terms and Conditions. The user license may be revoked by PACSIS at their discretion and at any time. In terms of the law and the present Terms and Conditions, the user may not copy, use, transfer, rent, sublicense, alter, adapt, attempt to modify or change the source code, perform reverse engineering, decompile or disassemble, in whole or in part, the content of the website. By accessing the website, the user acknowledges and accepts that its contents may be incomplete, inaccurate, not up-to-date, or that may not meet your needs and requirements. Access to and use of the website, including the display of web pages, are activities performed by the users. The users are the only and exclusive responsible for the use of the website and its contents. The PACSIS is not responsible for nor assumes responsibility for the use (if existing) of the website non-compliant with the legal provisions in force by the users. In particular, users are the only ones responsible for the communication of information or incorrect, false, or third-party data, without their consent, as well as by the incorrect use of it. The contents of the website may contain inaccuracies or typos. PACSIS is not responsible, nor can it be liable, by any means or mode, by the inaccuracies and errors, damages (if any) caused by or resulting from the use of information derived from the website or through the website by the users. The user is the only and exclusive responsible for the evaluation of the information and content obtained through the website. The website and all the information and content published in it can be changed by PACSIS at any time, periodically, and/or without notice. Considering that any content that may be downloaded or otherwise obtained, is the result of free decision of the user, and is made at your own risk, any damage (if any) to computers or loss of data resulting from the operations of download made by the user, will be of exclusive responsibility of the user and may not be imputed to PACSIS. PACSIS does not assume any responsibility for damages (if any) arising from the impossibility of access to the services available through the website or by data (if they exist) caused by viruses, damaged files, errors, omissions, service interruptions, cancellation of content, issues related to the Internet, service providers or with the phone connection and/or electronic communications, unauthorized accesses, data alterations, or in connection with the absence and/or inadequate operation of electronic devices of the user. The user is responsible for the safekeeping and correct use of your personal information, as well as responsible for any damage or injury caused to PACSIS or to third parties, resulting from the incorrect use, loss or theft of personal information. In the cases of registration, the user is responsible for the safekeeping and correct use of your credentials, which give access to the reserved area of the services. In these circumstances, the user will be responsible for creating your username and password. The user will also be responsible for the provision of specific information, which should be correct and updated. The user may not select a username belonging to a third party with the intention of using their identity. The user may not, in the same way, use the username of a third party without their express consent. The user must ensure the confidentiality of your password and should not share the same with third parties. The user is entirely and exclusively responsible for any actions taken through your user account, either directly or by third parties authorized by the user. PACSIS may revoke the license, at its discretion and at any time, in case it is identified the practice of any abusive, fraudulent, or illegal act. PACSIS has adopted the appropriate technical and organizational measures to safeguard the security of the services provided through the website, to ensure the integrity of the electronic data traffic related to its forms of use or knowledge unauthorized, as well as to prevent risks of dissemination, destruction or loss of the data and confidential or non-confidential information of its users, contained in the website or in connection with the unauthorized access or in breach of the legal provisions applicable to such personal data and information. PACSIS does not guarantee, nor can it ensure that the website is free of viruses or any other element that can adversely affect the technology. 4. Access to the Website. Interruption and Suspension. PACSIS shall use its best efforts to provide continuous access to the website. However, access to the website may be suspended, limited or interrupted at any time regardless of the reason. Access to the website may be occasionally restricted to allow for the recovery, maintenance or the introduction of new facilities or services. PACSIS will use the best efforts to regain access as soon as possible. PACSIS reserves the right to block access to any material and/or remove what material that can, in their discretionary understanding, cause the violation of the present Terms and Conditions. PACSIS reserves the right to terminate the accounts of users who violate the present Terms and Conditions, including in situations in which it is verified that the user is using proxy IP addresses in order to hide the use of multiple accounts, or when the user want to be identified as being in a country distinct from that in which he actually is, or is causing a disruption to the functioning of the website by any means. All rights are reserved. The website and all its contents, including, without limitation, articles, opinions, other texts, lists, manuals, photos, drawings, images, clips, videos or audio, or text marketing, as well as the trademarks, logos, domain names, and any other elements that may be covered by intellectual property rights (including source codes) and/or other forms of intellectual property rights (hereinafter ‘Material’), are the property of PACSIS or third parties, and are protected against use, copy or unauthorised disclosure by national laws and international treaties related to Intellectual Property Rights. None of the provisions of the Terms and Conditions and/or the content contained in the website may be interpreted as implicitly conferring, accepting or by any means licensing the right of use of any Material by any means, without the prior written consent of PACSIS or the third party owner of the Material or the intellectual property rights published on the website. The use, copy, reproduction, modification, republishing, update, download, sending by e-mail, transmission, distribution, or replication, or any other cause of action, abusive of the Material not specifically identified, but of a similar nature, are prohibited. In its capacity as user of the website, the user agrees not to use the Material for any unlawful purposes and not to violate the rights of PACSIS. The user may, however, view and display the content of the website and/or Material on a computer screen, store such content in electronic form on disk (but not on a server nor on a memory device connected to the Internet) or print one copy of such content for your own personal use and not commercial, but should keep all the information related to the intellectual property rights. Access to the website does not confer the user any right over the content made available by PACSIS. If the website makes available links (‘Links’) to websites of third parties or for content provided by third parties (‘Other Websites’), PACSIS hereby informs that the provision of links to such Other websites is included only for purposes that are solely informational and for convenience of the User. PACSIS does not control the Other Websites and therefore accepts no responsibility for such Other Sites or the content or products that the Other Websites (including, without limitation, the reference to social networks), and is not responsible for any damages or losses that may result from the use of the Other Websites by the User, as well as to the processing of personal data during your navigation operations on the internet. Access to any Other Website through a link existing on the website of PACSIS, will be made by the sole responsibility and risk of the User. The User should, therefore, pay particular attention when you connect to the Other Websites through links present on the website of PACSIS and read carefully their terms and conditions and privacy policies. f) will not use the software or other automatic mechanisms or manual to copy or access the control of the website or its content. The invalidity of any of the provisions contained in these Terms and Conditions shall be considered suppressed of such, while the other provisions remain in the same way in full force and producing their effects. This agreement will be governed by Portuguese law and shall be interpreted according to the Portuguese law, in accordance with the contracts entered into and performed in this country. In the absence of amicable agreement between the parties, their conflicts and disputes of any nature relating to the formation, execution or interpretation of this Agreement shall be resolved definitively by the Courts of law of Lisbon, with express waiver of any other. The user may contact the Customer Service for any issue related to the Terms and Conditions or for any issue related with the use of the website, by registered letter with acknowledgement of receipt to the address Estrada Nacional 6, Lote 107, 1.º Esq.,2610-171 Amadora or via e-mail to apoio.cliente@pacsis.com. Los presentes Términos y Condiciones regulan el acceso y uso del sitio web www.pacsis.com, de la responsabilidad de PACSIS Iberia, S.L. con domicilio social en Paseo de la Castellana, 118 – 7B, Madrid (en lo sucesivo, "PACSIS"). Cualquier cuestión legal relativa al sitio web podrá ser consultada en las secciones Política de Privacidad y Política de Cookies, que forman parte integrante de los presentes Términos y Condiciones. El uso de este sitio web por cualquier usuario se regirá por los siguientes términos y condiciones, lo que implica para su uso la aceptación de los mismos por el usuario. Si el usuario rechaza los presentes Términos y Condiciones, debe cesar el uso del sitio web. PACSIS podrá modificar o actualizar, en todo o en parte, los presentes Términos y Condiciones, así como la Política de Privacidad o la Política de Cookies. Cualquier cambio o actualización de los presentes Términos y condiciones, así como los de la Política de Privacidad o Política de Cookies, entrarán en vigor tan pronto como se publiquen en la sección correspondiente del sitio web. Se aconseja a los usuarios consultar regularmente las secciones de los Términos y Condiciones, la Política de Privacidad y la Política de Cookies para comprobar las versiones más actualizadas. El acceso y la utilización del sitio web están disponibles exclusivamente para uso personal y para la promoción de bienes y servicios considerados de interés para los visitantes / usuarios del sitio web o para comunicarse con ellos para otros fines (los "Servicios"). PACSIS se reserva el derecho de evaluar discrecionalmente el cumplimiento de los presentes Términos y Condiciones por parte de cualquier usuario. La violación de los Términos y Condiciones puede implicar la retirada de la licencia de uso concedida por PACSIS en virtud de la presente Cláusula 1 y, así, ejercer sus derechos en la máxima extensión posible permitida por la ley. Los usuarios se comprometen a indemnizar y exonerar a PACSIS, así como a representantes legales, socios y trabajadores, de cualquier daño, responsabilidades, reclamaciones o solicitudes de compensación, incluyendo gastos y costos de representación, solicitados por terceros como consecuencia del uso del sitio web en términos de incumplimiento con los presentes Términos y Condiciones, y / o en virtud de la violación de las condiciones previstas en los mismos, y / o resultantes de incumplimiento de las representaciones y garantías contenidas en los presentes Términos y Condiciones. Sin perjuicio de lo establecido en las demás cláusulas de los presentes Términos y condiciones, PACSIS autoriza a cualquier usuario a utilizar este sitio web únicamente con fines personales o informativos, según lo previsto en los presentes Términos y Condiciones. La licencia de uso podrá ser revocada por la PACSIS discrecionalmente y en cualquier momento. En virtud de la ley y de los presentes Términos y Condiciones, el usuario no podrá copiar, utilizar, transferir, alquilar, sublicenciar, cambiar, adaptar, intentar modificar o cambiar el código fuente, realizar operaciones de ingeniería inversa, descompilar o desmontar, en todo o en parte, el contenido del sitio web. Al acceder al sitio web, el usuario reconoce y acepta que el contenido del mismo puede estar incompleto, impreciso, no actualizado, o que no pueda satisfacer sus necesidades y requisitos. El acceso y uso del sitio web, incluyendo la visualización de páginas web, constituyen actividades ejecutadas por los usuarios. Los usuarios son los únicos y exclusivos responsables de la utilización del sitio web y de sus contenidos. PACSIS no es responsable, ni asume responsabilidades por el uso (si existe) del sitio web, de acuerdo con las disposiciones legales en vigor, por los usuarios. En concreto, los usuarios son los únicos responsables de la comunicación de información o datos incorrectos, falsos, o de terceros, sin su consentimiento, así como por el uso incorrecto de los mismos. Los contenidos del sitio web pueden contener incorrecciones o errores. PACSIS no es responsable, ni puede ser responsabilizada, por cualquier medio o modo, por las incorrecciones y errores, daños (si existen) causados resultantes del uso de información derivada del sitio web o a través del sitio web por parte de los usuarios. El usuario es el único y exclusivo responsable de la evaluación de la información y los contenidos obtenidos a través del sitio web. El sitio web y toda la información y contenidos publicados en el mismo pueden ser alterados por PACSIS en cualquier momento, periódicamente y/o sin previo aviso. Considerando que cualquier contenido que se descargue o por otro medio obtenido es resultado de una decisión libre del usuario y se efectúa por su cuenta y riesgo, cualquier daño (si existe) a los ordenadores o pérdida de datos resultantes de las operaciones de descarga efectuadas por el usuario, será de la exclusiva responsabilidad del usuario y no podrá ser imputada a PACSIS. PACSIS no asume ninguna responsabilidad por daños (si existen) resultantes de la imposibilidad de acceso a los servicios ofrecidos a través del sitio web o por datos (en su caso) causados or virus, archivos dañados, errores, omisiones, interrupciones del servicio, cancelación de contenidos, cuestiones relacionados con Internet, prestadores de servicios o con la conexión telefónica y/o telemática, accesos no autorizados, cambios de datos, o relacionados con la inexistencia y/o deficiente funcionamiento de los dispositivos electrónicos del usuario. El usuario es responsable de la custodia y correcta utilización de su información personal, así como responsable de cualquier daño o perjuicio causado a PACSIS o a terceras partes, resultante del uso incorrecto, pérdida o robo de la información personal. En los casos de registro, el usuario es responsable de la custodia y correcta utilización de sus credenciales, las cuales permiten el acceso al área reservada de los servicios. En estas circunstancias, el usuario será responsable de crear su nombre de usuario y contraseña. El usuario será también responsable por la prestación de información específica, la cual deberá ser correcta y actualizada. El usuario no podrá elegir un nombre de usuario perteneciente a tercero con el fin de utilizar su identidad. El usuario no podrá utilizar el nombre de usuario de un tercero sin su consentimiento expreso. El usuario es enteramente y exclusivamente responsable de cualquier acción efectuada a través de su cuenta de usuario, directamente o por terceros autorizados por el usuario. PACSIS podrá revocar la licencia, discrecionalmente y en cualquier momento, si se identifica la práctica de cualquier acto abusivo, fraudulento o ilegal. PACSIS ha adoptado las medidas técnicas y organizativas apropiadas para salvaguardar la seguridad de los servicios que usted preste a través del sitio web, asegurar la integridad de los datos de tráfico electrónico relacionados con las formas de uso o conocimiento no autorizadas, así como para evitar riesgos de diseminación, destrucción o pérdida de datos e información confidencial o no confidencial de sus usuarios, incluidos en el sitio web, o relacionados con el acceso - no autorizado o en incumplimiento de las disposiciones legales aplicables - a dichos datos personales e información. PACSIS no garantiza, ni podrá garantizar que el sitio web esté libre de virus o de cualquier otro elemento que pueda afectar negativamente a la tecnología. 4. Acceso al Sitio Web. Interrupción y Suspensión. PACSIS se esfuerza por ofrecer el acceso continuo al sitio web, pero el acceso al sitio web puede ser suspendido, limitado o interrumpido en cualquier momento independientemente del motivo. El acceso al sitio web puede ser limitado ocasionalmente para permitir la recuperación, mantenimiento o introducción de nuevas funcionalidades o servicios. PACSIS se esforzará por recuperar el acceso a la mayor brevedad posible. PACSIS se reserva el derecho de bloquear el acceso a cualquier material y/o remover cualquier material que pueda, en su entendimiento discrecional, provocar la violación de los presentes Términos y Condiciones. PACSIS se reserva el derecho de cerrar las cuentas de los usuarios que infrinjan los presentes Términos y condiciones, incluso en las situaciones en las que se haya comprobado que el usuario está usando proxy IP para ocultar el uso de cuentas múltiples, o desee ser identificado como situado en un país distinto del cual efectivamente se encuentra, o cause perturbaciones al funcionamiento del sitio web por cualquier medio. Se aconseja a los usuarios que lean y analicen la Política de Privacidad, que forma parte de los presentes Términos y Condiciones, para comprender cómo el sitio web recoge y utiliza los datos personales de los usuarios y los objetivos. Todos los derechos son reservados. El sitio web y todos sus contenidos, incluyendo sin limitar, artículos, opiniones, otros textos, listas, manuales de uso, fotografías, dibujos, imágenes, clips de vídeo o audio o textos de marketing, así como marcas, logotipos, nombres de dominio, y cualesquiera otros elementos que puedan ser cubiertos por derechos de propiedad (incluidos los códigos fuente) y/u otras modalidades de derechos de propiedad intelectual (en adelante "Material"), son propiedad de PACSIS o de terceros, y están protegidos contra el uso, la copia o la divulgación no autorizada por las leyes nacionales y tratados internacionales relativos a los Derechos de Propiedad Intelectual. Ninguna de las disposiciones de los Términos y Condiciones y/o de los contenidos que constan en el sitio web podrán interpretarse como implícitamente otorgando, aceptando o por cualquier medio licenciando el derecho de uso de cualquier Material por cualquier medio, sin el previo consentimiento escrito de PACSIS o del tercer propietario del Material o de los derechos de propiedad intelectual publicados en el sitio web. El uso, copia, reproducción, alteración, publicación, actualización, descarga, envío por correo electrónico, transmisión, distribución o duplicación, o cualquier otro acto abusivo del Material no específicamente identificado, pero de idéntica naturaleza, están prohibidos. En su calidad de usuario del sitio web, el usuario se compromete a no utilizar el material para fines ilegales y no violar los derechos de PACSIS. Sin embargo, el usuario puede ver y exhibir el contenido del sitio web y/o el material en la pantalla de un ordenador, almacenar dicho contenido en formato electrónico en el disco (pero no en un servidor ni en un dispositivo de memoria conectado a Internet) o imprimir una copia de dichos contenidos para su uso personal y no comercial, pero debe mantener toda la información relacionada con los derechos de propiedad intelectual. El acceso al sitio web no confiere al usuario ningún derecho sobre los contenidos ofrecidos por PACSIS. 7. Links para otros Sitios Web. Si el sitio web proporciona enlaces a sitios web de terceros o para contenidos ofrecidos por terceros ("otros sitios web"), PACSIS por el presente informa que la disponibilidad de enlaces a tales otros sitios web se incluye sólo con fines exclusivamente informativos y para conveniencia del usuario. PACSIS no controla los otros sitios web y, por lo tanto, no se responsabiliza por tales otros sitios web o por los contenidos o productos de los otros sitios web (incluyendo sin limitación, la referencia a redes sociales) y no se responsabiliza por cualquier daño o perjuicio que pueda resultar de la utilización de los otros sitios web por el usuario, así como del tratamiento de datos personales durante las operaciones de navegación por Internet. El acceso a cualquier otro sitio web, mediante una conexión existente en el sitio web de PACSIS, será efectuado por exclusiva responsabilidad y riesgo del usuario. El usuario deberá prestar especial atención cuando se conecte a otros sitios web a través de vínculos en el sitio web de PACSIS y leer con atención los siguientes términos y condiciones y políticas de privacidad. f)no utilizará software u otros mecanismos automáticos o manuales para copiar o acceder al control del sitio web o de su contenido. La nulidad de alguna de las disposiciones contenidas en los presentes Términos y Condiciones se suprimirá de ellas, quedando las restantes disposiciones del mismo en vigor y produciendo sus efectos. Este contrato se regirá por la ley española e interpretada de acuerdo con el derecho español, de acuerdo con los contratos celebrados y ejecutados en este país. A falta de acuerdo entre las partes, sus conflictos y controversias de cualquier tipo en relación con la formación, la aplicación o interpretación del presente Acuerdo se resolverá definitivamente por las Cortes de Madrid, con renuncia expresa a cualquier otro. El usuario puede ponerse en contacto con el Servicio de Cliente para cualquier pregunta relacionada con los Términos y Condiciones o para cualquier cuestión relacionada con el uso del sitio web, a través de una carta certificada con acuse de recibo para la dirección Paseo de la Castellana 118, 7B, 28046 Madrid, o través de e-mail para apoyo.cliente@pacsis.com. 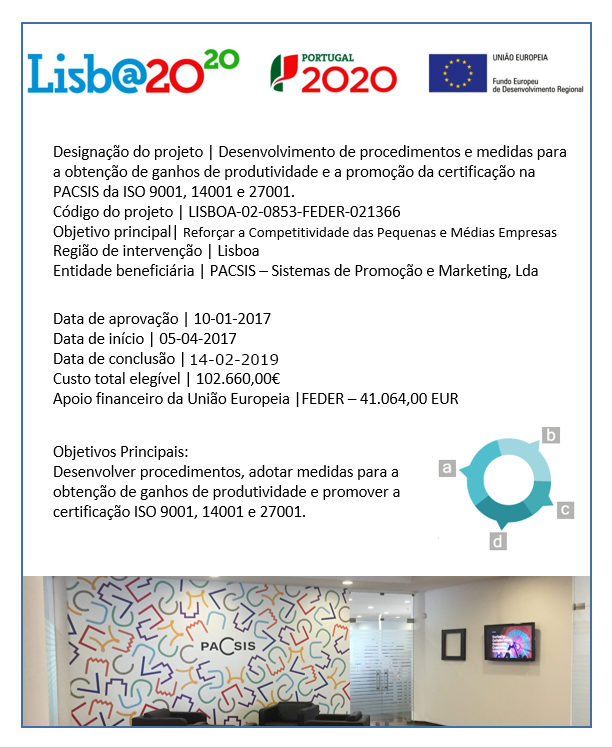 Os presentes Termos e Condições regulam o acesso e utilização do websitewww.pacsis.com , da responsabilidade da PACSIS – Sistemas de Promoção e Marketing, Lda., sociedade com sede em Estrada Nacional 6, Lote 107, 1.º Esq., 2610-171 Amadora (doravante “PACSIS”). Quaisquer questões legais referentes ao website poderão ser consultadas nas secções Política de Privacidade e Política de Cookies, os quais constituem parte integrante dos presentes Termos e Condições. A utilização deste website por qualquer utilizador será regulada pelos seguintes Termos e Condições, implicando a sua utilização uma aceitação dos mesmos pelo utilizador. Caso o utilizador rejeite os presentes Termos e Condições, deve cessar a utilização do website. A PACSIS poderá alterar ou atualizar, no todo ou em parte, os presentes Termos e Condições, bem como a Política de Privacidade ou a Política de Cookies. Quaisquer alterações ou atualizações dos presentes Termos e Condições, bem como os da Política de Privacidade ou Política de Cookies, entrarão em vigor logo que publicados na respectiva secção do website. Os utilizadores são aconselhados a consultar regularmente as secções dos Termos e Condições, da Política de Privacidade e da Política de Cookies para verificarem as versões mais atualizadas. O acesso e a utilização do website são disponibilizados exclusivamente para utilização pessoal e para a promoção de bens e serviços considerados de interesse para os visitantes / utilizadores do website ou para comunicar com os mesmos para outros fins (os “Serviços”). A PACSIS reserva o direito de avaliar discricionariamente o cumprimento dos presentes Termos e Condições por parte de qualquer utilizador. A violação dos Termos e Condições poderá implicar a retirada da licença de utilização concedida pela PACSIS, nos termos da presente Cláusula 1 e, bem assim, exercer os seus direitos na máxima extensão possível permitida por lei. Os utilizadores comprometem-se a indemnizar e a exonerar a PACSIS, bem como legais representantes, parceiros e trabalhadores, de quaisquer danos, responsabilidades, reclamações ou pedidos de compensação, incluindo despesas e custos de representação, peticionadas por terceiros em consequência da utilização do website em termos desconformes com os presentes Termos e Condições, e/ou em virtude da violação das condições previstas nos mesmos, e/ou resultantes de incumprimento das representações e garantias constantes dos presentes Termos e Condições. Sem prejuízo do constante nas demais cláusulas dos presentes Termos e Condições, a PACSIS autoriza qualquer utilizador a utilizar este website apenas para fins pessoais ou informativos, conforme previsto nos presentes Termos e Condições. A licença de utilização poderá ser revogada pela PACSIS discricionariamente e em qualquer momento. Os utilizadores são os únicos e exclusivos responsáveis pela utilização do website e dos seus conteúdos. A PACSIS não é responsável, nem assume responsabilidades pela utilização (se existente) do website desconforme às disposições legais em vigor pelos utilizadores. Os conteúdos do website podem conter incorreções ou gralhas. A PACSIS não é responsável, nem poderá ser responsabilizada, por qualquer meio ou modo, pelas incorreções e erros, danos (se existentes) causados ou resultantes da utilização de informação derivada do website ou através do website por parte dos utilizadores. O utilizador é o único e exclusivo responsável pela avaliação da informação e conteúdos obtidos através do website. O website e toda a informação e conteúdos publicados no mesmo podem ser alterados pela PACSIS a qualquer momento, periodicamente e/ou sem aviso prévio. Considerando que quaisquer conteúdos que venham a ser descarregados ou por outro meio obtidos, resultam de decisão livre do utilizador e são efetuados por sua conta e risco, qualquer dano (caso exista) aos computadores ou perda de dados resultantes de operações de descarregamento efetuada pelo utilizador, será da exclusiva responsabilidade do utilizador e não poderá ser imputada à PACSIS. A PACSIS não assume qualquer responsabilidade por danos (caso existam) resultantes da impossibilidade de acesso aos serviços disponibilizados através do website ou por dados (caso existam) causados por vírus, ficheiros danificados, erros, omissões, interrupções do serviço, cancelamento de conteúdos, questões relacionadas com a Internet, prestadores de serviços ou com a ligação telefónica e/ou telemática, acessos não autorizados, alterações de dados, ou relacionados com a inexistência e/ou deficiente funcionamento de dispositivos electrónicos do utilizador. O utilizador é responsável pela guarda e correta utilização da sua informação pessoal, bem como responsável por qualquer dano ou prejuízo causado à PACSIS ou a terceiras partes, resultante da utilização incorreta, perda ou furto da informação pessoal. O utilizador é inteira e exclusivamente responsável por quaisquer ações efetuadas através da sua conta de utilizador, diretamente ou mediante terceiros autorizados pelo utilizador. A PACSIS poderá revogar a licença, discricionariamente e a qualquer momento, caso seja identificada a prática de qualquer ato abusivo, fraudulento ou ilegal. A PACSIS adotou as medidas técnicas e organizacionais adequadas a salvaguardar a segurança dos serviços por si prestados através do website, assegurar a integridade dos dados de tráfego electrónico relacionados com as formas de utilização ou conhecimento não autorizadas, bem como para evitar riscos de disseminação, destruição ou perda de dados e informação confidencial ou não confidencial dos seus utilizadores, constantes do website, ou relacionados com o acesso – não autorizado ou em incumprimento das disposições legais aplicáveis – aos referidos dados pessoais e informação. A PACSIS não garante, nem poderá garantir que o website esteja livre de vírus ou de qualquer outro elemento que possa afetar negativamente a tecnologia. A PACSIS envida os seus melhores esforços para disponibilizar o acesso contínuo ao website, contudo, o acesso ao website poderá ser suspenso, limitado ou interrompido a qualquer momento independentemente do motivo. O acesso ao website poderá ser limitado ocasionalmente para permitir a recuperação, manutenção ou introdução de novas funcionalidades ou serviços. A PACSIS envidará os melhores esforços para recuperar o acesso com a maior brevidade possível. A PACSIS reserva-se no direito de bloquear o acesso a qualquer material e/ou remover qual material que possa, no seu entendimento discricionário, provocar a violação dos presentes Termos e Condições. A PACSIS reserva o direito de encerrar as contas de utilizadores que violem os presentes Termos e Condições, incluindo nas situações em que seja verificado que o utilizador se encontra utilizar proxy IP addresses no intuito de esconder a utilização de contas múltiplas, ou pretenda ser identificado como estando num país distinto do qual efetivamente se encontra, ou cause perturbações ao funcionamento do website por qualquer meio. Todos os direitos são reservados. O website e todos os seus conteúdos, incluindo sem limitar, artigos, opiniões, outros textos, listas, manuais de utilização, fotografias, desenhos, imagens, clips vídeos ou áudio ou textos de marketing, bem como marcas, logótipos, nomes de domínio, e quaisquer outros elementos que possam ser abrangidos por direitos de propriedade (incluindo os códigos fonte) e/ou outras modalidades de direitos de propriedade intelectual (doravante “Material”), são propriedade da PACSIS ou de terceiros, e estão protegidos contra a utilização, a cópia ou a divulgação não autorizada pelas leis nacionais e tratados internacionais relativos aos Direitos de Propriedade Intelectual. Nenhuma das disposições dos Termos e Condições e/ou dos conteúdos constantes do website poderão ser interpretados como implicitamente conferindo, aceitando ou por qualquer meio licenciado o direito de utilização de qualquer Material por qualquer meio, sem o prévio consentimento escrito da PACSIS ou do terceiro proprietário do Material ou dos direitos de propriedade intelectual publicados no website. A utilização, cópia, reprodução, alteração, republicação, atualização, descarregamento, envio por e-mail, transmissão, distribuição ou duplicação, ou qualquer outro ato abusivo do Material não especificamente identificado, mas de idêntica natureza, são proibidos. Na sua qualidade de utilizador do website, o utilizador compromete-se a não utilizar o Material para fins ilegais e a não violar os direitos da PACSIS. O acesso ao website não confere ao utilizador qualquer direito sobre os conteúdos disponibilizados pela PACSIS. Caso o website disponibilize ligações (“Links”) para websites de terceiros ou para conteúdos disponibilizados por terceiros (“Outros Websites”), a PACSIS pelo presente informa que a disponibilização de ligações a tais Outros websites são incluídas apenas para fins exclusivamente informativos e para conveniência do Utilizador. A PACSIS não controla os Outros Websites e, por isso, não se responsabiliza por tais Outros Websites ou pelos conteúdos ou produtos que os Outros Websites (incluindo sem limitar, a referência a redes sociais) e não se responsabiliza por quaisquer danos ou prejuízos que possam resultar da utilização dos Outros Websites pelo Utilizador, bem como quanto ao tratamento de dados pessoais durante as operações de navegação na internet. O acesso a qualquer Outro Website, mediante uma ligação existente no website da PACSIS, será efetuado por exclusiva responsabilidade e risco do Utilizador. O Utilizador deverá, assim, prestar particular atenção quando se conecte a Outros Websites através de ligações existentes no website da PACSIS e ler com atenção os respetivos termos e condições e políticas de privacidade. f)não utilizará software ou outros mecanismos automáticos ou manuais para copiar ou aceder ao controlo do website ou do seu conteúdo. O utilizador poderá contactar o Serviço de Cliente para qualquer questão relacionada com os Termos e Condições ou para qualquer questão relacionada com a utilização do website, através de carta registada com aviso de recepção para a morada Estrada Nacional 6, Lote 107, 1.º Esq.,2610-171 Amadora ou através de e-mail para apoio.cliente@pacsis.com.